“bolting” longleaf add to the vertical structure of a landscape design. 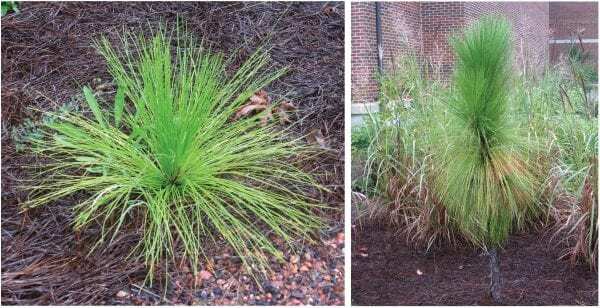 Why should you consider planting longleaf pine in urban landscapes? 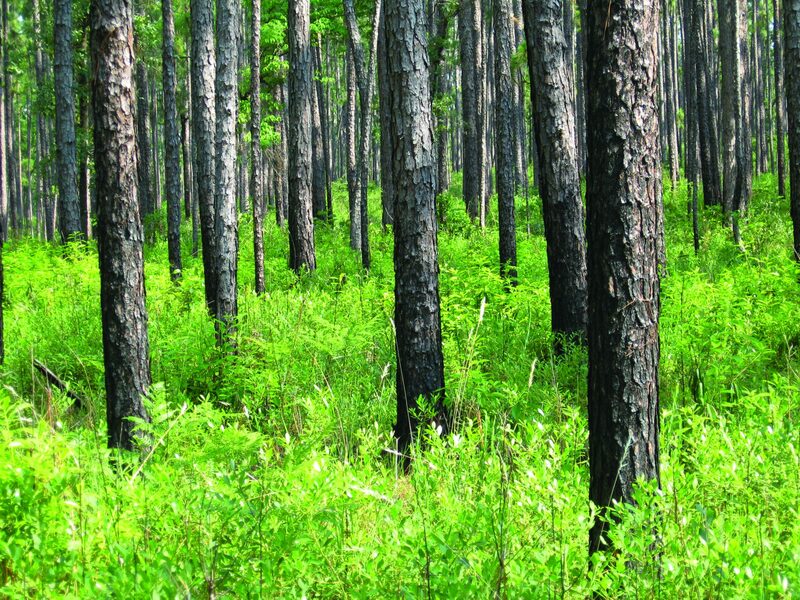 Longleaf pine is found across a wide variety of natural settings in the Southeast. With little attention, longleaf pine trees can be grown in parks and residential areas across the United States. History. Longleaf forests played an integral part in the development of our country, supporting early industries, including naval stores such as tar and pitch. Aesthetics. For visual effects, few trees can compare with longleaf pine. Mature longleaf trees add character to urban areas. Likewise, immature longleaf pine trees are attractive throughout many stages of their life. Wildlife. Many birds and animals use the longleaf pine for food and shelter. Pine straw and decorative products. Longleaf pine straw has a rich brown color and is often preferred in the landscape to that of other southern pines. Large, beautiful cones produced by the trees are also sought for many floral and decorative applications. Damage resistance. Longleaf pine is highly resistant to southern pine beetles and fusiform rust. It is the most windfirm of the southern pines. Grows wells on moist soils; however, does not thrive on alkaline (pH > 6.5) or very wet soils. Longleaf pine need full sunlight, so plant in a location with limited overhead competition. Remove any turf grass from an area about 3 feet in diameter from where seedling is to be planted. Break up the soil to a sufficient depth to reduce compaction.Add a few inches of water to settle soil. Plant the tree seedling so that soil plug is approximately 0.5”to 1.5”above the ground surface. 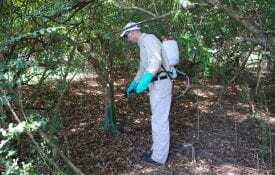 Reduce any competition around the trees either by using herbicides or by mowing. 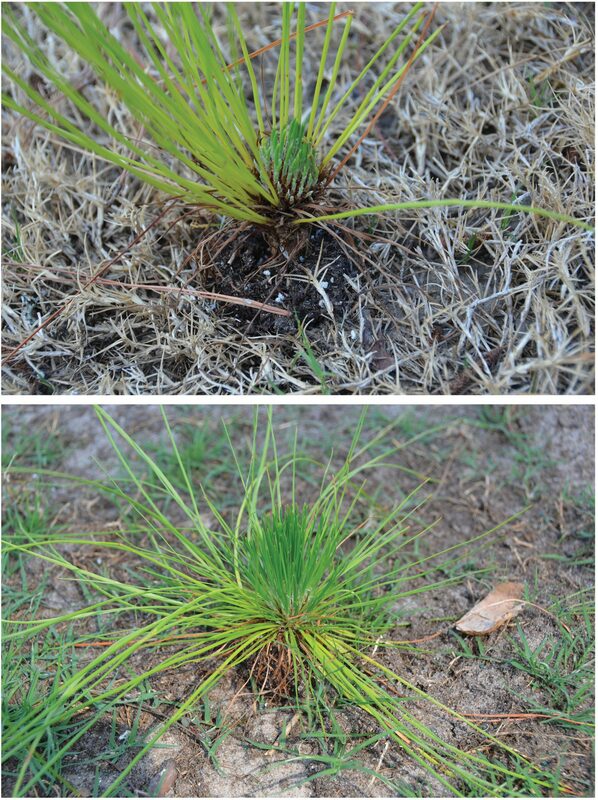 Use care to keep herbicide spray off of longleaf seedling foliage. Also, be careful not to damage or girdle tree stems with mowing equipment. Do not fertilize trees. 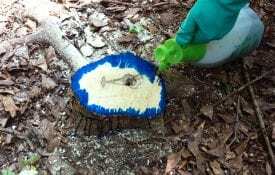 Heavy fertilizer can lead to excessive cankers or deformations of the tree. 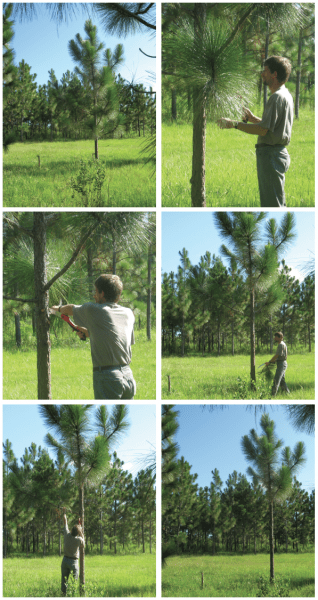 Longleaf pine trees planted in open areas tend to retain their lower limbs. Lower limbs may reduce the natural aesthetic appeal of longleaf pine by creating a bushy-looking tress. Longleaf pines may be pruned during any season other than spring. Pruning greatly enhances tree form, but be aware that tree growth may slow temporarily. This is normal. To limit impacts on growth, leave 40 to 50 percent crown when pruning. First—prune when trees are 15 to 20 feet tall up to 7 to 10 feet. Second—prune up to 17 feet when tree reaches 35 to 40 feet. Prune branches almost flush to the tree leaving approximately a 1/4″ stub. DO NOT cut into the trunk because this will cause a large scar. Try to keep the pruning saw as vertical as possible. DO NOT paint over pruning scars. Longleaf pine naturally grows in dense stands where trees self prune.To mimic this natural process, plant seedlings approximately 7 to 10 feet apart in groups of three or more for best tree form and aesthetic appeal. Resist the urge to plant potted longleaf pine. These trees are often root-bound and are prone to tipping over as they mature. Although longleaf pine will grow in colder climates, take special care to keep heavy accumulations of snow and ice off of branches to prevent breakage. Remember that longleaf pines grow to be large trees that can reach heights of 80 to 100 feet and live more than 150 years. Download a PDF of Planting Longleaf Pine in the Southern Urban Landscape, FOR-2031.